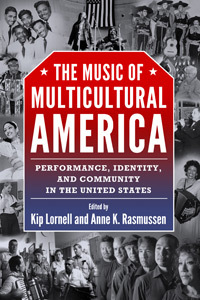 The Music of Multicultural America: Performance, Identity, and Community in the United States, Kip Lornell and Anne K. Rasmussen, eds. Jackson: University of Mississippi Press, 2016. As revealed in The Music of Multicultural America, past hoary debates over identity no longer make conventional sense. Read Sarah Morelli’s essay and you’ll learn that a Southeast Asian artist you’ve just discovered didn’t learn her licks or dance steps in Mumbai; she learned them in an immigrant community in California. That’s also good news. As society becomes more complex, the yearning for community grows stronger—not for the isolated gemeinschaft villages of yesteryear, but for intentional cultural spaces where the past and future collide. They also comingle with all manner of outside influences: formal training, media, cross-cultural contacts…. Lots of visiting Irish musicians would agree with Ann Morrison Spinney’s assessment that Celtic music is more vibrant in greater Boston than it is in parts of Dublin. And it’s probably not purely “Irish” in either place. Call it cultural diffusion. Essays by Brenda Romero, Christopher Scales, and Gabriel Desrosiers discuss myriad ways in which Native American performance is a pastiche of pan-tribal memories, innovation, and outside influence (especially Hispanic rhythms and groves in the Southwest). Pure Cajun? Mark Dewitt makes us wonder what that might be, especially when performers such as Clifton Chenier or Queen Ida gain pop fame. Again there is good news. Within these cross-fertilized communities one finds cultural creativity that’s miles from cookie-cutter TV productions, sugary pop, or the processed beats of radio chart-toppers. If audiences are as bored with these as they claim to be, the future of ethnically flavored entertainment might well exceed the wishful thinking of diehard fans. Multicultural America is filled with fascinating details, case studies, and thought-provoking ideas. It’s not a breezy read; its tone and analyses are probably beyond that of most undergraduates. Most of the writers are ethnographers, ethnomusicologists, or both, and the essays are distillations of their field research. There are 16 chapters covering everything from Arab music in Detroit to steel drum bands in Brooklyn. Footnotes and internal references direct readers to specific recordings and archival videos, though many of these now have parallels on YouTube. My YouTube reference highlights another drawback: the need to update links and (in some cases) the material itself. Several essays are based on dated fieldwork whose present-day relevance needs greater articulation. I agree that the Riot Grrrl phenomenon was important in cultural and political terms, but its heyday was the 1990s. These days the Riot Grrrl label is slapped onto expressions that are often distant from its original feminist punk fervor. Is this a natural mutation, or does it represent a wave that crested and left behind only appropriations and misappropriations? We need a more thorough exploration of such themes and updated analyses, as well as how older studies resonate with more recent phenomena–the surge of Spanish language music being an obvious example. Still another question is an old one among folklorists: What defines multicultural expressiveness, the form or the performer? Do we agree with Susan Asai that European classical music played by a talented sensei musician is “transculturated?” Or is it just classical music played by a person of Asian descent? Multicultural America is useful as a sampler that probes cultural diversity within a land that fosters it, but its main audience is graduate students and other academics. Its sheer breadth is such that many readers will be lost at times. (What this reviewer doesn’t know about the classical dances of Northern India is pretty much everything!) The best approach is to dip in. If you like a chapter’s taste, imbibe with gusto; if you don’t, move on­––there are other treats to savor.